Home Novità News | Gorilla Glass 2,presentato al CES spessore ridotto del 20%! 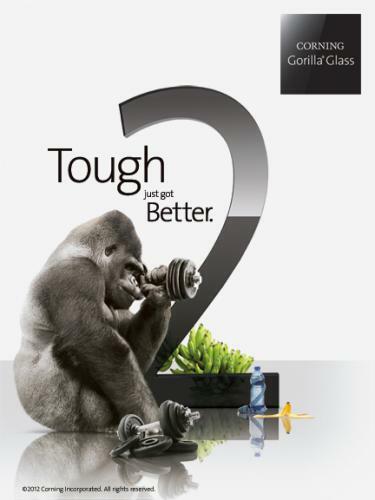 News | Gorilla Glass 2,presentato al CES spessore ridotto del 20%! Corning ha presentato l'evoluzione del suo vetro ultra resistente. Gorilla Glass 2 si distingue dalla prime generazione per la riduzione di spessore di circa 20 %. Il tutto grazie ad un nuovo materiale, graziea al quale gli smartphone futuri saranno sempre più sottili, con maggiore sensibilità nel touch. CORNING, N.Y., January 9, 2012 – Corning Incorporated (NYSE: GLW) introduces Corning®Gorilla®Glass 2, the next generation of the company’s widely accepted, damage-resistant cover glass for consumer electronic devices, at the International Consumer Electronics Show in Las Vegas this week. The outstanding performance benefits of this new glass will be showcased through live demonstrations in the Corning booth, #12642 Central Hall, during show hours tomorrow, Jan. 10, through Friday, Jan. 13. Corning Gorilla Glass 2 enables up to a 20 percent reduction in glass thickness, while maintaining the industry-leading damage resistance, toughness, and scratch resistance customers have come to expect from the world’s most widely deployed cover glass. The thinner Gorilla Glass 2 enables slimmer and sleeker devices, brighter images, and greater touch sensitivity. These benefits can provide electronics manufacturers with superior design flexibility as they address consumer demand for increasingly high-performing, touch-sensitive, and durable mobile devices. “Corning Gorilla Glass has enjoyed tremendous market adoption in the high-growth mobile handset and computing device market, providing a replacement for plastic and legacy soda-lime glass as a protective cover and elegant design solution,” saidJames R. Steiner, senior vice president and general manager, Corning Specialty Materials. “We knew Corning Gorilla Glass could get even better. So, in response to our customers’ drive toward thinner form factors, we designed this new glass to enable meaningful reduction in thickness without sacrificing the outstanding glass performance for which Gorilla Glass has become highly recognized. This glass, along with Windows operating system innovations from Microsoft, will help deliver exceptional beauty, performance, and toughness for new Windows PCs. You will see this early this year with Windows-based PCs which we expect to be the first in-market laptops designed to leverage the performance of our new second-generation glass,” Steiner remarked. Product qualification and design implementation for Corning Gorilla Glass 2 are underway with Corning’s global customers, a number of whom are expected to unveil new devices using Corning Gorilla Glass 2 during the coming months. First introduced in 2007, Corning Gorilla Glass set the industry standard for damage-resistant cover glass. Today it is the most widely deployed cover glass, used by more than 30 major brands and designed into more than 575 product models, spanning more than 500 million units worldwide. As one of the company’s fastest growing businesses, Corning Gorilla Glass is expected to reach more than $700 million in 2011 sales, nearly triple 2010 results. CorningIncorporated (www.corning.com) is the world leader in specialty glass and ceramics. Drawing on more than 160 years of materials science and process engineering knowledge, Corning creates and makes keystone components that enable high-technology systems for consumer electronics, mobile emissions control, telecommunications and life sciences. Our products include glass substrates for LCD televisions, computer monitors and laptops; ceramic substrates and filters for mobile emission control systems; optical fiber, cable, hardware & equipment for telecommunications networks; optical biosensors for drug discovery; and other advanced optics and specialty glass solutions for a number of industries including semiconductor, aerospace, defense, astronomy, and metrology. Next articleNews | Presentato il poggiatesta con lettore DVD e Android!